The pressuretrol is an important boiler control mounting as how pressuretrol works? is the today question asked by someone in group, simple answer is that the pressuretrol in a boiler works as pressure control switch that turns the boiler on and off at adjusted pressure. The pressuretrol starts and shutdown the boiler according to adjusted pressure it also controls its operating range. For example, an average operating range of a steam boiler may be 240 to 250 psi. When the steam pressure in the boiler drops 10 psi, the boiler will start up automatically. When the pressure reaches to 250 psi, it will shutdown the boiler. In case of modulating pressuretrol it controls the boiler firing at high and low within adjusted range with the help of modulating motor linked with fuel valve. The Location of a boiler pressuretrol is the top pressure side of the boiler. It is important that it be protected with a siphon just like the boiler pressure gauge and that the trol should be mounted straight. Some pressuretrols have a little arrow this purpose. This is especially important in case of the mercury type pressuretrol. Unless it is in a vertical position it will not work properly. See how the pressuretrol and siphon should be installed. The pressuretrol has two adjusting screws and two scales. One scale is the main pressure scale the other is the differential. To set a pressuretrol for the operating range you want, you would proceed as follows. The cut-in plus the differential is equal to the cut-out. For example, if you want the boiler to cut in at 240 Psi and cut out at 250 Psi, set the cut-in at 240 psi and the differential at 10 psi. The boiler will then cut out at 250 pounds. Table shows present examples of cut-in, differential, and cut-out points that’s how pressuretrol works. It can manually be reset by pressing reset button at the top. The operator can adjust any combination that suits the boiler requirements. It is important to regularly check (inspection) the mercury tube in the pressuretrol. If the mercury starts to vaporize there will not be a good electric contact through the mercury. This will raise the heat and as the heat increases, the mercury will vaporize further, the pressure will build up and the mercury tube will explode. If the mercury tube shows signs of discoloring or the mercury seems to be sticking to the glass in little drops, it would be wise to replace the tube. The difference between on off pressuretrol and modulating pressuretrol is that it controls the high and low firing of the boiler. High fire is the maximum amount of fuel burned and low firing the A boiler should always start off in low fire and shut off in low fire. It should always be firing for longer periods than it is off. This helps to maintain a good furnace temperature and reduces the cooling effect on brickwork, which in turn helps to cut down on maintenance and improves boiler efficiency. 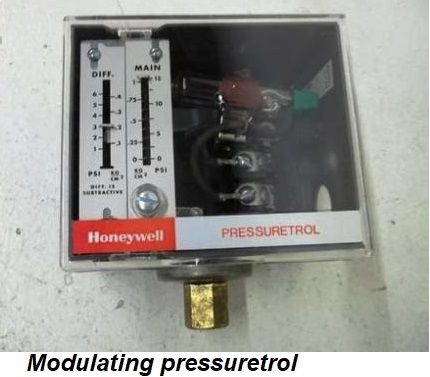 Honeywell pressuretrols are most reliable and widely used in steam boilers.